Stopsley High School is currently benefitting from an environment that has been acoustically treated to reduce noise disruption following the installation of ROCKWOOL flat roof insulation products. Stopsley High School in Luton received funding from the Government in 2013, via the Priority School Building Programme, to demolish and rebuild some buildings while others receive upgrades. A new school building was built to provide 64 classrooms, a four court sports hall, creative and music spaces and a special needs facility. Main contractor, Interserve worked with sub-contractor, Briggs Amasco and Acoustic Consultant, Arup to deliver a modern, purpose-built and well-insulated school building. The project required a thermal performance of 0.15 W/m2k in the school building, the controlling of the noise generated in hight traffic areas and the stringent acoustic performance requirements of BB93 needed to be met in order to achieve a target noise reduction of Rw44Db. Approximately 600m2 of the 150mm ROCKWOOL HARDROCK Muti-Fix boards were adhesively applied on the roof of the building, offering maximum density and exceptional dimensional stability. 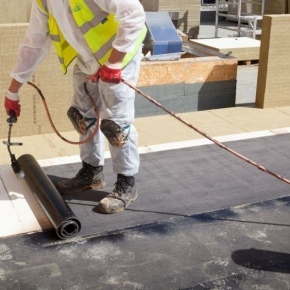 The roof has a non-combustable surface that was ideal for the application of the torch applied bitumen waterproofing system with ROCKWOOL HARDROCK Multi-Fix Underlay placed across the roof, followed by the HARDROCK Multi-Fix roof boards. Tony Sutton, Contracts Manager at Briggs Amasco said the ROCKWOOL products act as a sound deadening layer, which helped in controlling the high level of noise coming from the sports and the music halls of the school. The products also deliver optimum levels of thermal and acoustic performance, which helped us achieve the set requirements. The HARDROCK Multi-Fix boards have helped to deliver a comprehensive thermal, sound and fire safe solution that is suitable for this type of multi-purpose application. HARDROCK Multi-Fix products control sound and are fully compatible for use with other flat roofing systems. In addition, ROCKWOOL products have excellent fire resistance properties, providing a high level of fire protection that will last the lifetime of the school building.